Last year RT reported that overcrowded prisons were forcing the White House to think about victimless crime. The outlay for federal prisons had swelled quickly to $6.9 billion in a “growing crisis,” according to the Inspector General. Then, in July of this year, President Obama took the shocking action of granting freedom to dozens of nonviolent drug offenders. The Justice Department generated six criteria that inmates must meet to be considered in the call for clemency. A small fraction of the 30,000 applicants advanced to final consideration, and only a small fraction of them reached the president’s desk. Any time government releases people from a cage for a nonviolent deed is great. Obama’s action was a tiny gesture to the national groundswell for drug decriminalization. When we consider the reality of the US jail system and the number of people locked up for nonviolent offenses, freeing 46 people becomes almost a joke (except to the people who were freed, of course). It is estimated that 77% of federal prison inmates are there for nonviolent offenses, or what is better called Victimless Crimes. This descriptive is not limited to drug offenses. It includes a range of behaviors deemed illegal by the State, but in reality there is no victim. Michael Suede provides compelling reasoning why all drug offenses are victimless crimes, and all “public-order” offenses are also victimless crimes. Public-order offenses include such things as immigration and weapons charges, as well as things that hardly anyone would consider even offensive—public drunkenness, selling lemonade without a license, dancing in public, and feeding the homeless without a permit. 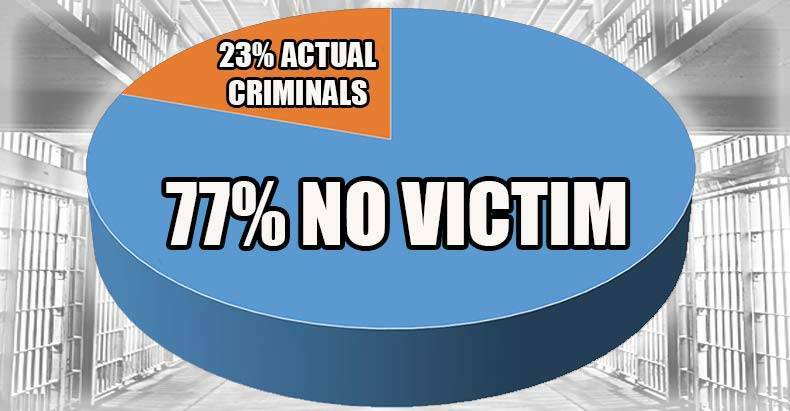 With this rationale, we find that 77% of inmates in prison are there for victimless crimes. Since 1980, when the drug war began a frenzied rate of incarceration, the US prison population quadrupled to over 2.3 million, increasing 30% over the past ten years. A primitive, immoral view of drug use combined with a corporatist state seeking to profit from prison construction, quickly produced the highest rate of incarceration in the world, more than five times the world average. The US holds roughly 25% of the world’s prison population. The fate is worst for black males between the ages of 20 and 34, with one in nine behind bars. We know that the justice system brings anything but justice. If you have lots of money, you are virtually guaranteed to remain free with the help of attorneys exploiting a convoluted system set up for just this. Or maybe you know the right politician, who has most likely committed crimes himself with no punishment. Primitive laws and prison profits are powerful beasts to overcome. But the tragedy of victimless crimes bringing in most of the prison inmates is not only one of immorality. As Suede describes, this creates a burden both to society and to the economy. The individual is deprived of contributing anything productive, instead costing taxpayers at least $47,000 a year. The only contribution an inmate can make is to enrich a corporation with ties to the prison industry complex, where they are virtually forced to work for about 25 cents an hour. We can include “public-order” offenses in the category of unjust laws contributing to that demand. Are Obama’s clemency grants the start of something good, or are they just a pitiful gesture that will become a talking point for some future public address? Another meaningful step would be for Congress to revisit the suite of archaic mandatory sentencing laws that put so many people in prison with no consideration of circumstances. Victimless crimes represent the worst nature of a broken justice system. There is not enough ink in the White House for the president to grant clemency to all of the unfortunate souls caught up in this atrocity of the US government.